Abstract: Patriot's Extreme Performance PDC1G5600ELK dual channel DDR memory is some of the fastest on the market, and it most certainly caters towards enthusiast users. With the sheer quantity of high-speed DDR memory modules available right now, one would be forgiven for thinking that JEDEC, the body governing the standards of this industry, had set the memory speed limit much higher than the 'PC3200' standard. It hasn't actually. This void has created an interesting question; since there is no standard for memory manufacturers to adhere to past PC3200, should manufacturers begin making platform specific high-speed memory? For the most part, the majority of Intels' current chipsets are DDR-2 only. Faced with a drop in demand from the absence of Intel-based customers, memory manufacturers have begun 'performance tuning' DDR memory modules for specific AMD platforms. The recent explosion of memory modules built with Winbond "UTT" (Untested) DRAM is a good indication of where things are headed, and that there is still plenty of life in the DDR market. The age old question between bandwidth and latency has popped up again and as usual, the answer is not very clear. The Athlon64 is a very unusual creature and even after a lot of testing, it is not clear which is better for a high performance system. 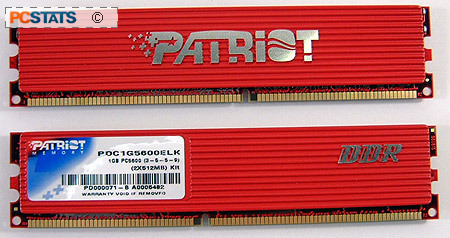 One such company to introduce a platform specific set of performance tuned PC5600 'DDR700' RAM is Patriot Memory. The companies' newest dual channel DDR modules are fast; a default speed of 350 MHz! In fact, these new DDR DIMMs are so fast that we are approaching DDR2-level speeds here.... Ironically, the new super high speed DDR700 DIMMs also have DDR2-type latencies. Patriot's Extreme Performance PDC1G5600ELK dual channel DDR memory is some of the fastest on the market, and it most certainly caters towards enthusiast users. On its website, Patriot Memory takes the progressive step of stating that these PDC1G5600ELK modules are tuned to run on the DFI LANParty NF4 motherboard - essentially what we have here is DDR performance tuned for a specific AMD Athlon64 platform. There is a good reason for selecting the DFI LANParty NF4-series motherboards over all others, they are among the best overclocking motherboards in recent history. The two Patriot Memory DDR700 modules tested here are each 512MB in size, and come in a dual channel kit (1GB total) with a lifetime warranty. Patriot Memory knows that memory cannot just perform well, it also has to look awesome; I think it's safe to say the Patriot PDC1G5600ELK DIMMs look sweet. Each 512MB module is rated to run at DDR700 speeds with timings of 3-5-5-9-2T at the default voltage of 2.8-2.9V. The timings are not the greatest in the field of DDR, but that is the sacrifice one has to make for such high speeds. The memory has a lifetime warranty, and users experiencing problems can always call Patriot Memory tech support (if only that number was a toll free 1-800 number). The quick installation guide is detailed and to the point, and even covers setting memory timings properly which is a step that most users may not be aware of. The Patriot Memory PDC1G5600ELK DIMMs come jacketed in a rather unique set of aluminum heatspreaders that certainly stand out. Heatspreaders are not necessary at low speeds or voltages, but can come in handy when things are overclocked to the max. The red aluminum heatspreaders found on the PDC1G5600ELK DIMMs have a grooved surface and are attached to the DRAMs via strong thermal tape. We could not safely remove them to get a look at the DRAM below, so I don't recommend you try to pull the heatspreaders off either. Pg 2. Overclocking to DDR700 - fact or myth?